Our pick for Cool Actor this time around is Powers Boothe, a guy I’ve been a fan of since his Emmy-winning turn as the sunglasses-sportin’ leader of the People’s Temple in the TV movie Guyana Tragedy: The Story of Jim Jones (1980). Boothe was a farmboy from Snyder, Texas who came up through the theater. His first credited movie role was in The Goodbye Girl (1977), but after his portrayal of Jim Jones, his film career really caught fire. In 1981, his long association with director Walter Hill (The Warriors) began with the underrated Southern Comfort, a Vietnam allegory about a group of National Guardsmen who wind up on the bad side of some angry Cajuns in the swamps of Louisiana. It’s one of my favorite movies and features a terrific cast alongside Boothe (including Keith Carradine, Fred Ward, Peter Coyote, Brion James and Sonny Landham). Unfortunately, it suffered from a terrible tagline on the poster (“Not since Deliverance“) and some not-so-stellar reviews, but Southern Comfort is definitely worth your time if you haven’t seen it. Now, I have a rather tenuous personal connection to Boothe, as well — I was an extra on Red Dawn (1984), and of course Boothe played fighter pilot Lt. Colonel Andrew Tanner in that flick. One morning, I was fortunate enough to wind up having breakfast with Mr. Boothe, and he not only told some entertaining stories but paid for my meal, as well (you can read my slightly embarrassing tale of working on Red Dawn at the EyeCrave Network). From 1983 to 1986, Boothe played the lead in the HBO series Phillip Marlowe, Private Eye. Other standouts include Extreme Prejudice (1987), Tombstone (1993), Frailty (2001), Sin City (2005), and his recurring roles on Deadwood and 24. Boothe also did the buddy cop thing with the late Brandon Lee in 1992’s Rapid Fire. In recent years, Boothe has joined the ranks of many a fine actor lending their talents to the world of animation and video games, including Turok and DC Universe Online. 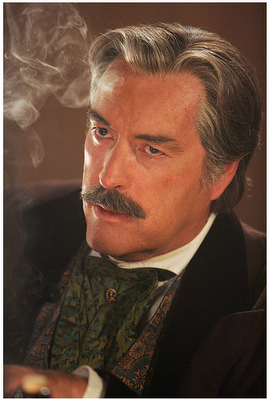 At the age of 62, Powers Boothe is still going strong, and we look forward to many more fine performances from the man.